Every summer and fall we try to take a trip to the Jordan Pond House in Bar Harbor Maine. We are thrilled when we have guests, it’s another excuse to take a trip! The Jordan Pond House has a beautiful view of the lake and mountains, plus, my favorite….. Lobster Chowder and Popovers! Since I can’t always get to Bar Harbor, I decided to make my own popovers, you can only imagine how thrilled my kids were, they kept asking when they would be ready?? So easy and so delicious, you have to eat two! Preheat oven to 425 degrees. Beat the eggs at high speed until lemon colored (two to three minutes). On slowest speed add very slowly one half cup of the milk; beat until well mixed. Sift and measure flour, salt and soda; add slowly (with mixer going on slow speed) the dry ingredients. When mixed, stop the beater, scrape the sides of the bowl with a spatula, turn to medium speed and slowly add the remaining milk; beat two minutes. Turn to high speed and beat five to seven minutes. Batter should be smooth and about the thickness of heavy cream. 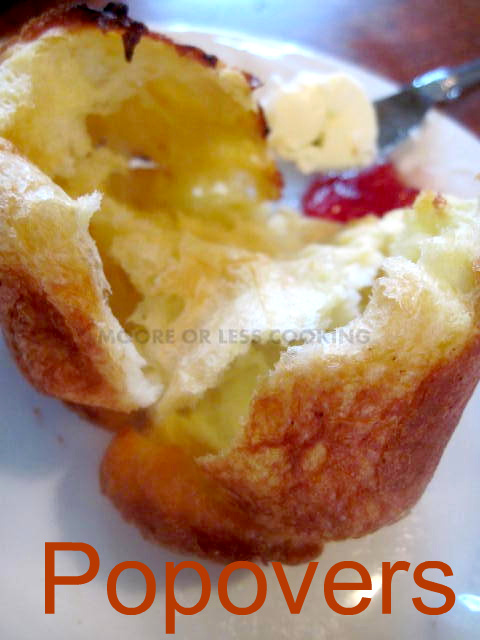 Pour batter through a strainer, and then into well-greased muffin tins or a popover pan. Bake on the middle shelf of the preheated oven at 425 degrees for the first fifteen minutes. Without opening the oven, reduce the temperature to 350 degrees and bake fifteen to twenty minutes longer. They are best served at once, but may be kept in the warm oven for up to five minutes.